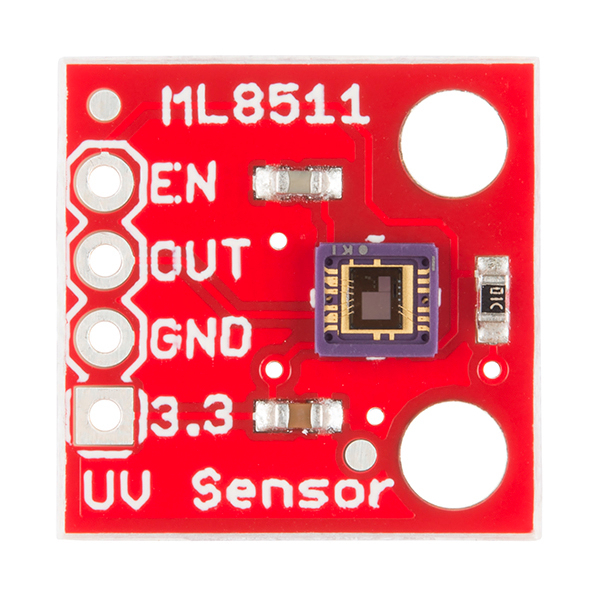 The ML8511 sensor breakout is an easy to use ultraviolet light sensor. The MP8511 UV Sensor outputs an analog signal in relation to the amount of UV light it detects. This can be handy in creating devices that warn the user of sunburn or detect the UV index as it relates to weather conditions. This sensor detects 280-390nm light most effectively. This is categorized as part of the UVB (burning rays) spectrum and most of the UVA (tanning rays) spectrum. The ML8511 sensor is very easy to use. It outputs a analog voltage that is linearly related to the measured UV intensity (mW/cm2). If your microcontroller can do an analog to voltage conversion, then you can detect the level of UV. Load the ML8511 UV Sensor Read Example onto the Arduino of your choice. The ML8511 UV Sensor outputs an analog signal in relation to the amount of UV light it detects. These last two connections are a little different. Connect the EN pin on the breakout to 3.3V on the breakout. This will enable the output. Also connect the 3.3V pin of the breakout to Arduino pin 1.
spectrum and most of the UVA (tanning rays) spectrum. These last two connections are a little different. Connect the EN pin on the breakout to 3.3V to enable the device. Also connect the 3.3V pin of the Arduino to Arduino analog pin 1. This example uses a neat trick. Analog to digital conversions rely completely on VCC. We assume this is 5.0V, but if the board is powered from USB this may be as high as 5.25V or as low as 4.75V. Because of this unknown window, it makes the ADC on the Arduino fairly inaccurate. To fix this, we use the very accurate onboard 3.3V reference (accurate within 1%). So by doing an analog to digital conversion on the 3.3V pin (by connecting it to A1) and then comparing this reading against the reading from the sensor, we can extrapolate a true-to-life reading, no matter what VIN is (as long as it's above 3.4V). For example, we know the ADC on the Arduino will output 1023 when it reads VCC. If we read 669 from the connection to 3.3V, what is the voltage powering the Arduino? It's a simple ratio! Solving for VCC, we get 5.05V. 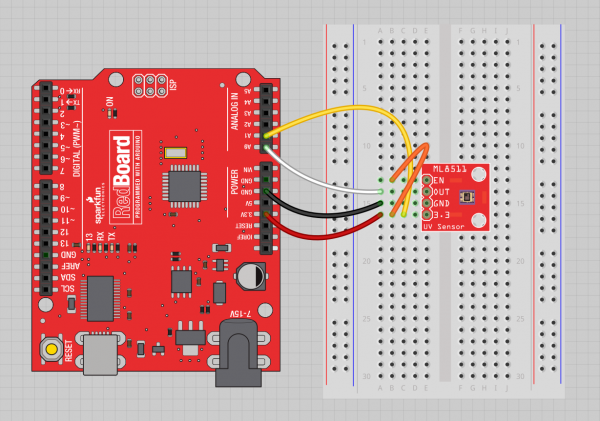 If you've got a digital multimeter, you can verify the 5V pin on your Arduino. uvLevel is what we read from the OUT pin. refLevel is what we read on the 3.3V pin. Solving for UV_Voltage, we can get an accurate reading. Test your sensor by shining daylight or a UV LED onto the sensor. We've also found that a bright LED flashlight will change the reading slightly. What other devices around your house might output UV? With the UV sensor up an running, what can we do with it? If we integrate the UV exposure over time, we can calculate the total UV load. But how much UV is good? 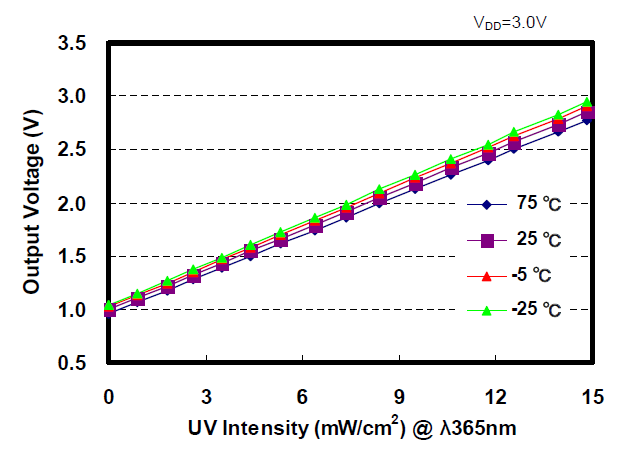 For the UV-A or near ultraviolet spectral region (315 to 400 nm), exposure to the eye should not exceed 1 milliwatt per square centimeter (1.0 mW/cm2) for periods greater than 1000 seconds (approximately 16 minutes). The UV sensor could be used on a pair of eyeglasses, to make sure you don't sunburn your eyes. Because skin types vary greatly, it gets a bit harder to predict sun burn and skin damage. Luckily NOAA gives us some direction. Irradiance (a dose rate used in photobiology) is described in watts (unit of power) per square meter (W m2) or watts per square centimeter (W cm2). Radiant exposure (H), is dose, and is described in joules (unit of energy) per square meter (J m2) or joules per square centimeter (J cm2). Note that a watt is a joule per second thus the dose rate (W cm2) multiplied by the exposure duration (seconds) equals dose (J cm2).